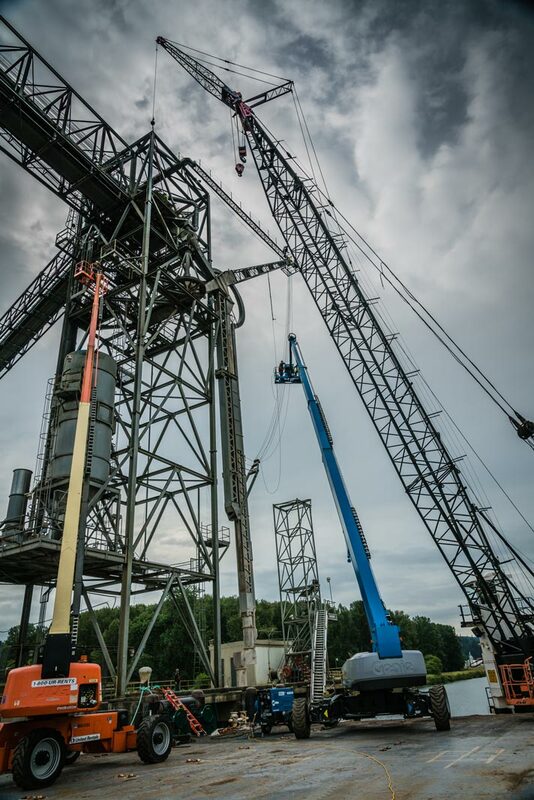 While crane and transport services are core to many operations, our industrial millwright services group deserves its spot in the light. 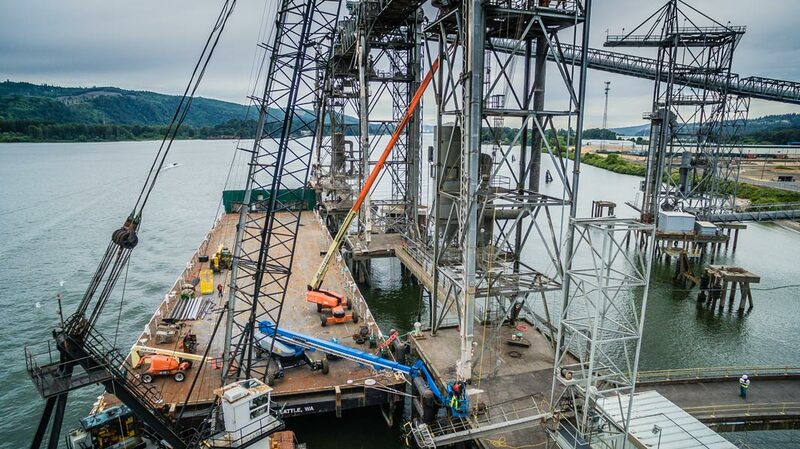 When Kalama Export saw one of its spouts hinder efficient operations, our team from the Portland, Oregon office stepped in to diagnose and solve the problem despite difficult conditions. 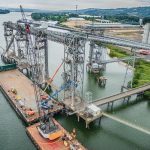 This project took the Millwright Division to Kalama Export’s international grain terminal on the Columbia River at the Port of Kalama in Kalama, WA. It operates at 300 million bushels per year, transloading grains from corn and wheat to soybean, millet, oats, and more. 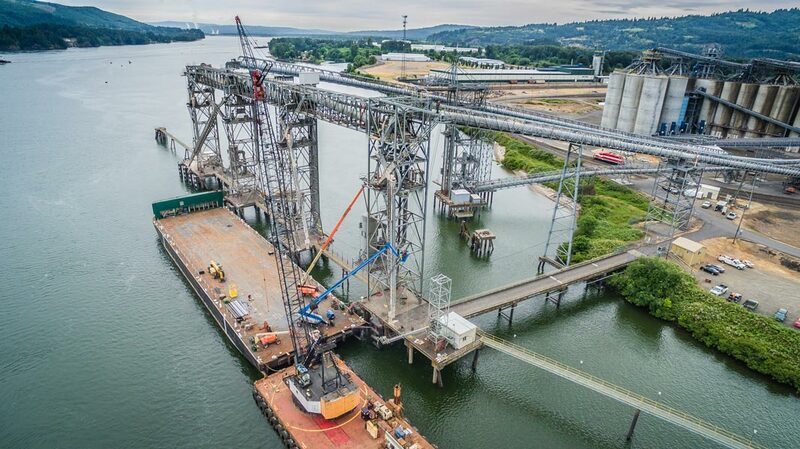 The terminal receives shipments via trains, trucks, and river barges. The grains are cleaned and graded, then staged for export into ocean-going ships moving around the world. Two conveyors move product from storage silos to the dock loader gallery, where four articulating spouts pour it into the holds of the vessels. When one of those spouts stops operating efficiently, the entire operation is compromised. Vessels usually wait at anchor in the river so that as one is leaving full, the other arrives immediately after. Efficiency and reliability is key to plan schedules, maximize predictability, and optimize the entire process. In April, we received a call from the terminal operator to investigate a potential problem with spout #3. Its slewing motion was reacting with unusual control, and had to remain out of service. As a result, production and filling slowed by 25%, from the usual 48 hours per vessel to 60 hours per vessel. That reduced output meant that the client could fill notably less than its usual 130 vessels per year, losing significant profit. Delivery to the terminal would have to be either slowed or redirected until the exact problem was discovered and fixed. In other words, quick and thorough work was absolutely essential for everyone involved. Each of the terminal’s four spouts are designed to articulate through 180 degrees of rotation, from vertical down to 8 degrees above horizontal. The spout itself is a 24″ diameter steel pipe, which telescopes from 60 feet to a full extension of 100 feet. The combined load of the spout pipe assembly is approximately 50,000 pounds when empty. Our first step was to send our industrial services team to the site. 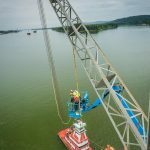 The crew performed an inspection, and found that the main support pivot pin responsible for steering and supporting the spout structure was severely fractured, and failure was imminent. 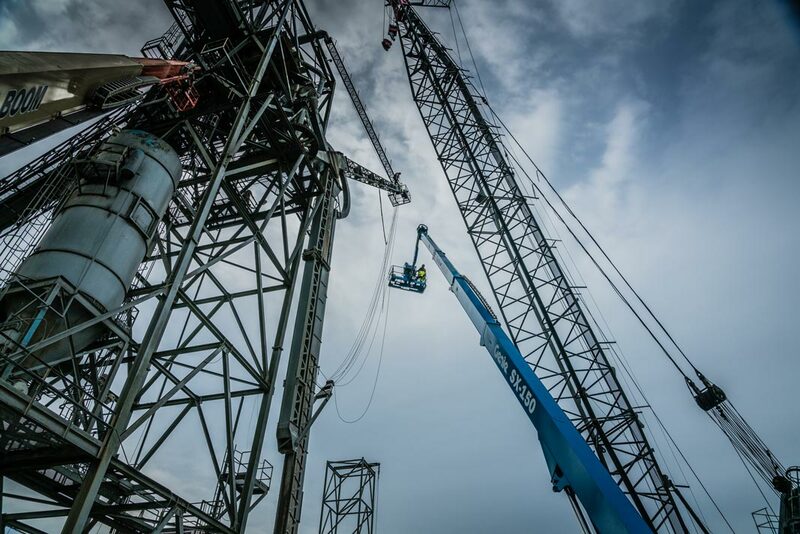 Access to the location was difficult, so the crew had to think of a realistic solution that still resolved the issue quickly and permanently. 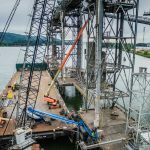 The flat deck barge and man lift provided river-side access, while the scaffolding provided shore-side access to the work. As a result, we could approach multiple work activities simultaneously. 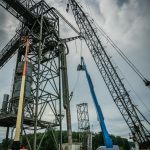 The water crane supported the equipment loading and unloading, as well as additional access to the work elevation as needed. 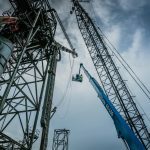 Finally, pad eyes and rigging were employed to support, reposition and control the load while demolition, welding and refurbishment took place. Because engineering data and drawings were not available from the customer, our team used information derived from field dimensions. We recreated new structural plates on our CNC plasma cutting table, while building a new pivot pin and receiver tube in our shop lathes. Custom-made bronze bearings, establishing critical dimensions for running and interference fits, along with washers, retainer nuts, and bolts were created by Omega Morgan with “just-in-time” delivery for assembly. After the inspection, we were able to complete the repair without injuries or near-miss accidents despite the difficult access point. From start to finish, the project took three days, getting the client’s terminal back up to full capacity. We’re happy to say that we completed the project to full customer satisfaction. 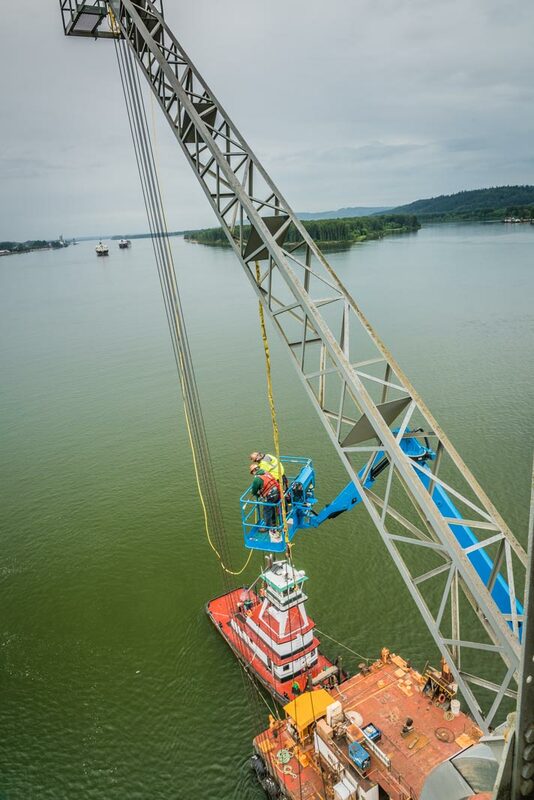 The speed and efficiency at which our Millwright Division–the “Tiger Team”–was able to complete repairs after the inspection was made possible by our existing expertise and various partnerships with the barge crew and other teams. We were able to alleviate a potentially significant problem, and create a fix to last long-term. It’s just another day, #doingtheimpossibledaily.